Over the course of their lives, the elders in the Legacy Project raised over 3000 children, and had a total of around 40,000 years of married life! So they have some very good advice. Geraldine offers tips based on her long and happy marriage, and her experience as a parent and foster parent. A number of the Legacy Project elders had an important lesson for living: Develop the ability to listen – that is, to really listen. Bill, 80, discovered the importance of being truly attentive to what others are saying. It may seem like a small point, but it has huge benefits for relationships with others. Gene has lived a very full life and continues to enjoy it into his 80s. He shares a tip he offered his children – if you are not using exclamation points, perhaps you aren’t looking for everything life has to offer. The elders in the Legacy Project agree on one thing: Young people worry way too much about getting old. They find it a time of new experiences and even adventure. Marilyn and Sy share advice on aging from their own experience. Eleanor’s advice for happiness is the latest addition to our video library of elder wisdom. 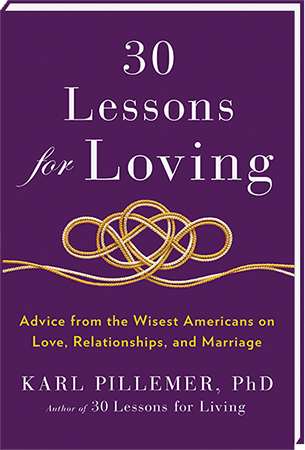 She offers two lessons that are clear and to the point: How to be happy, and how to avoid regrets. Enjoy! See many more Legacy Project elders on video at our YouTube Channel. I’m already regretting the fact that I can’t pass up any holiday food item that catches my eye. So my thoughts turned to regrets today, and how to avoid them. Frances and Helga (both in their 80s) have some great advice for regret-free living. Spend some time with them in these new videos. What do you learn over 95 years of living? Ruth is an inspiring example of what we learn from our own experiences that we can pass on. One interesting finding of the Legacy Project (described in the book 30 Lessons for Living) is that most elders did not endorse corporal punishment of children; Ruth tells you why. She also offers tips for a happy marriage. Should we worry so much about getting older? Research shows that many young people do. So one of the most surprising findings from the Legacy Project is how positive most of the elders are about life after 70. In these two compelling videos, Jackie and Dr. Monty share their strategies for positive aging. I’m not sure if there is a more inspiring elder from the Legacy Project than Marilyn. I find that if I need a pick-me-up, I can listen to her wisdom about squeezing everything you can from life and saying yes to opportunity. These are great lessons from someone who has lived a highly adventurous life – thoughts to be truly savored.